We have been fascinated with the plight of the bees for the last couple of years. A few months ago, when we got the chance to build an installation that tells their story, we jumped at the opportunity. 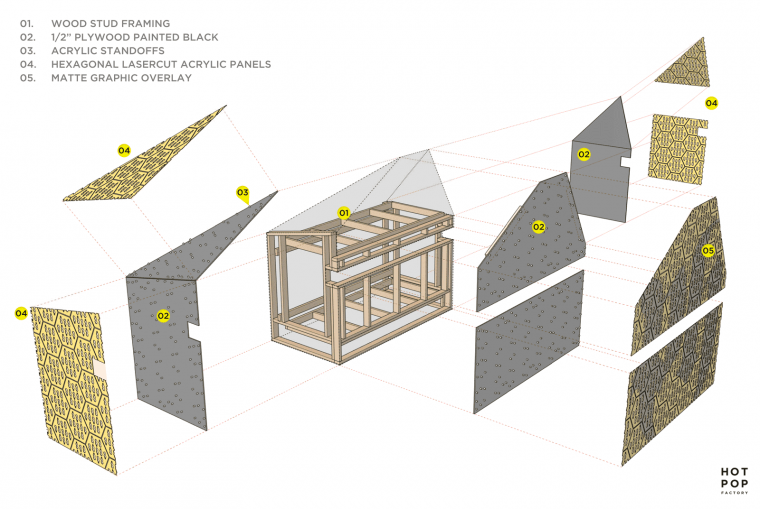 As the fabricators for the People’s Hive, we approached the project as a system of prefabricated parts (kind of like IKEA furniture) that are digitally manufactured with a laser cutter and CNC router. Here’s how the installation came together. Earlier this spring, an architect, Janna Levitt, and an artist, Myfanwy Macleod, travelled to Japan to learn about the fine art of beekeeping and how the decline of the bee population has tremendous consequences for our own existence on earth. Two weeks later, the two returned to Canada with an idea. 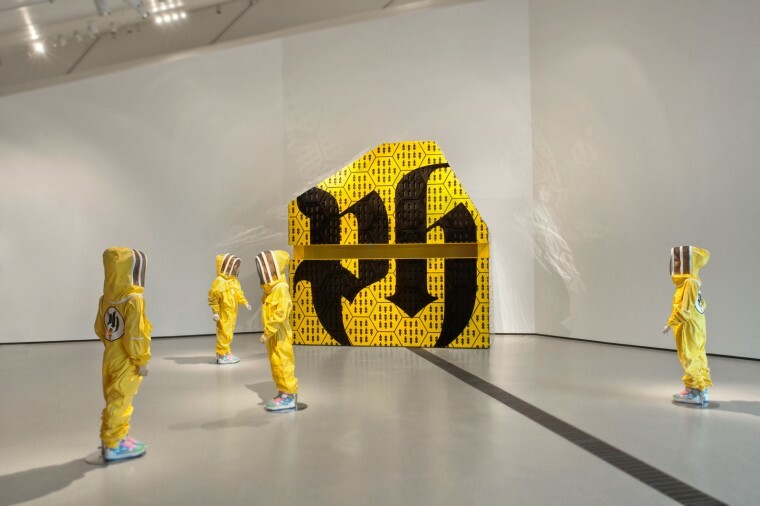 The intent was to communicate the bottom-up mentality of a hive community to inspire awareness and action surrounding the issue of colony collapse disorder. If the hive mentality can motivate thousands of bees to form an organized network working for a common goal, perhaps it is also a model humans can emulate to solve the problem at hand. A few weeks later, this question evolved to become an art installation, known as the People’s Hive, that would be a part of the Carbon 14 Climate is Culture exhibition at the Royal Ontario Museum. Matt and I came into the story around the point where the idea of People’s Hive required transformation into a real-life physical artifact. 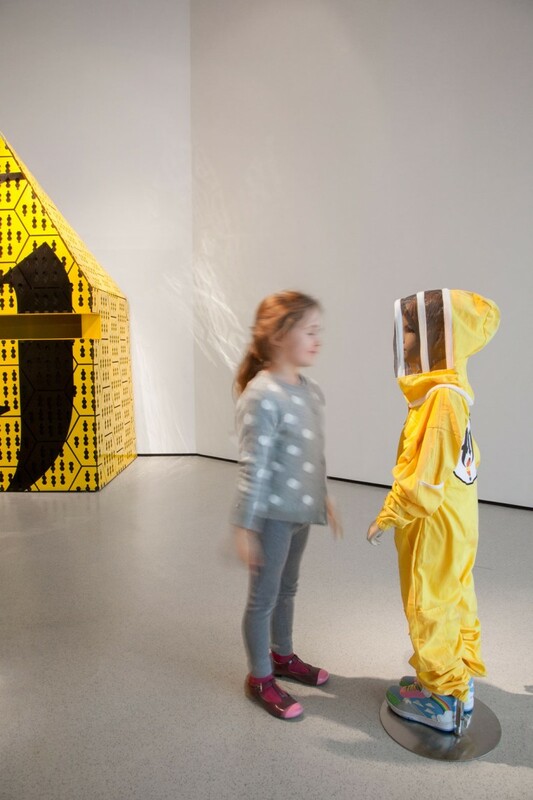 We worked together with Janna and Myfanwy and drew upon several architectural archetypes – the shed, bunker, and kiosk, as a starting point to bring physical form to the idea of the hive. 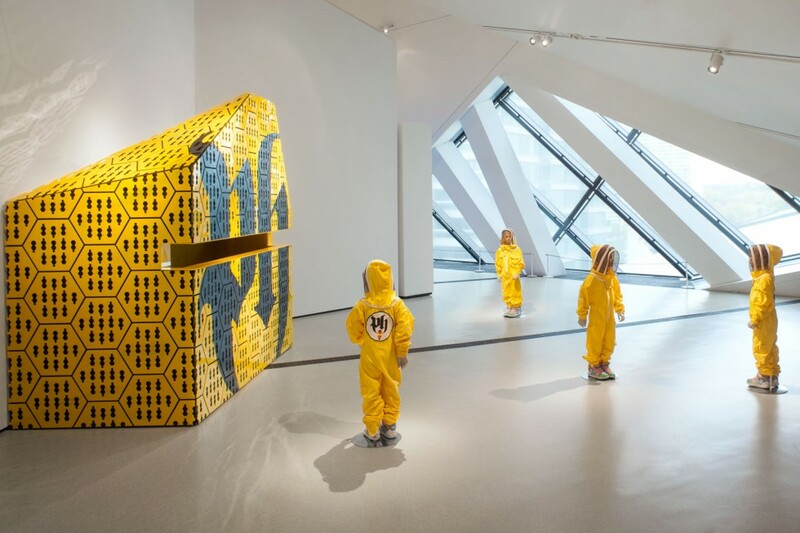 The final design of the structure was to be covered in a luxurious honey comb pattern and surrounded by 4 child-size beekeepers, designed to manipulate the viewer’s perception and play with their sense of human scale. In alignment with the bottom-up mentality of the hive, the design and fabrication of the Hive structure started with the smallest element in the piece – the hexagonal panel that makes up the honeycomb cladding. 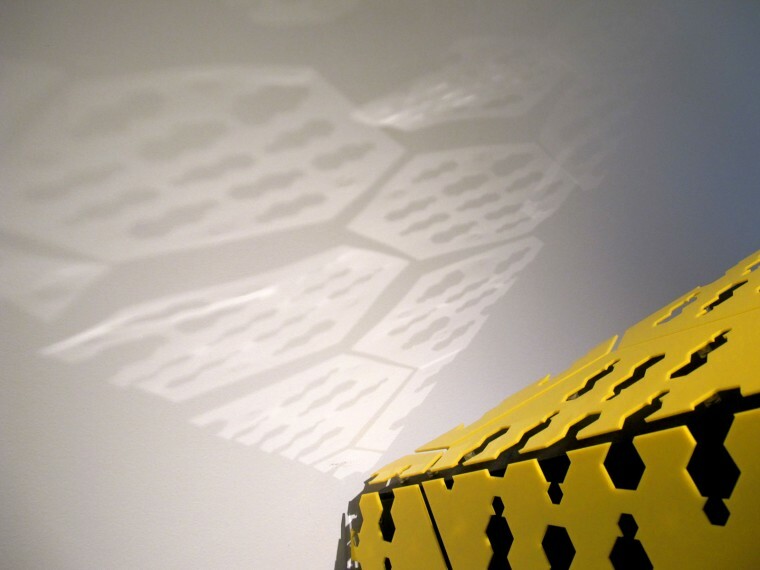 Lasercut from 1/8″ acrylic in the perfect shade of yellow, the size of each panel was determined by optimizing the number of tiles that can be cut from a standard sheet of 4’ x 8’ material. These panels, when tiled, became a grid that governed the exact size and shape of the overall structure. The plywood shell that the honeycomb panels are fastened to was precision cut on a computer controlled milling machine. We then built the stud framing to fit inside that shell. This process may seem a bit backwards, but it allowed for the most accuracy so that the prefabricated panels can tile perfectly on each face of the structure. 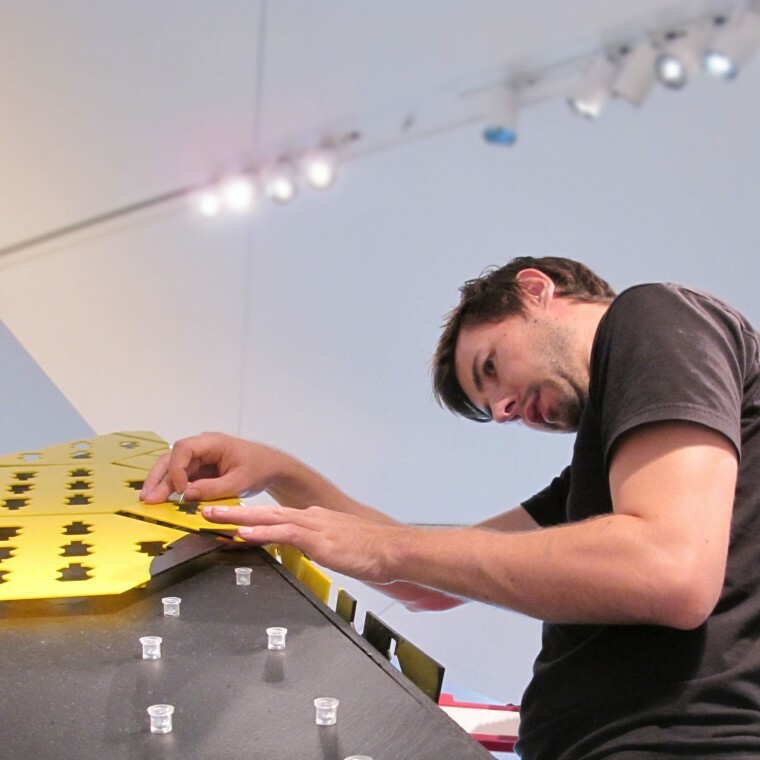 Every component of the Hive was designed and built to assemble with bolts and connectors on site. We put in the effort to design each component so that it can easily be transported, installed and disassembled for future exhibitions. The hard work completely paid off! Check out this time-lapse of the installation process. The project was a fantastic success and will be on display at the ROM until February 2014.